Were you at a levee? The crowd at the Lieutenant Governor’s New Year’s event would probably have been thicker but for the rain. We lined up for only about 15 minutes outside his big white tent on the Fort York grounds. Two or three soldiers carrying old-styled muskets and wearing tall imposing hats stood guard. They were friendly. Then, with umbrellas dripping, we continued to queue briefly inside to sign a visitors’ book. Most of us ignored the two bottles of hand sanitizer on the table. Two soldiers in 18th century British uniforms answered my questions about their dress and posed for pictures in front of a portrait of John Graves Simcoe, the founder of Toronto. Their hats were trimmed with ostrich feathers. People in line chatted. A band played Santerias music, a religion I first heard of in Cuba. Later, two soldiers fifed and drummed and a bagpipe played. The entertainment was appropriately multicultural. 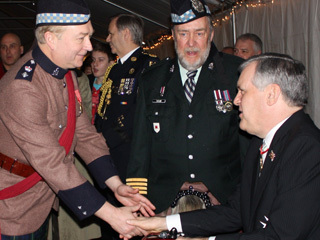 Lieut.-Governor David Onley was congenial and approachable. We didn’t have to wait for him to speak first though he represents the Queen in Ontario. I introduced myself, wished him a Happy New Year, and told him I was trying to encourage more visible minorities to attend occasions such as this. He agreed there was a need and wished me well. The bagpiper broke through the line to introduce several elderly officers in Highland kilts to our host. We moved on to help ourselves to tea and coffee, and a table full of gingerbread cookies and muffins. Then we sauntered back out to the rain. It was true. The crowd was mainly white. Among the many military types were elderly men in spiffy uniforms trimmed with battle medals and ribbons, thick braid, and gleaming brass buttons. There were women and a few children. I noticed less than a handful of black and brown faces. There were a couple dozen Asian faces. It was a pity more visible minorities weren’t there to enjoy the historical Canadian atmosphere. Who attended the other levees? Mayor Rob Ford’s, and Mayor Hazel McCallion?